AP CPS Employees are eligible for Retirement gratuity, Death gratuity benefit, Contributory Pension Scheme (NPS) shall be eligible for benefit of ‘Retirement gratuity and Death gratuity’, A.P. Revised Pension Rules 1980. Retirement gratuity and Death gratuity’ benefit to the Indian Government Employees covered by National Pension System on the same terms and conditions. 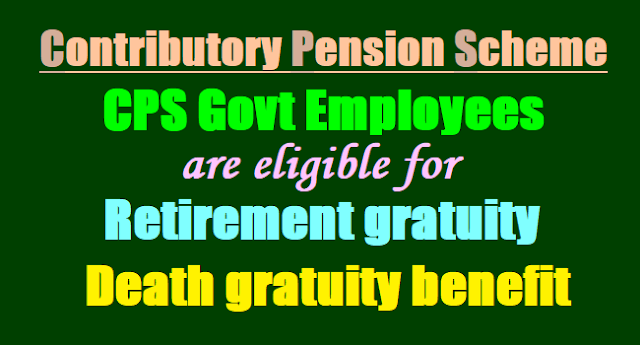 Government employees covered by Contributory Pension Scheme (NPS) shall be eligible for benefit of ‘Retirement gratuity and Death gratuity’ on the same terms and conditions, as are applicable to employees covered by A.P. Revised Pension Rules 1980. GOVERNMENT OF ANDHRA PRADESH, PENSIONS - Contributory Pension Scheme - Extension of benefits of ‘Retirement Gratuity and Death Gratuity’ to the State Government employees covered by Contributory Pension Scheme (National Pension System) – Orders issued. 2. O.M. No.7/5/2012, P&PW(F)/B, dated 26.8.2016 of Ministry of Personnel Public Grievances &Pensions, Department of Pension and Pensioners Welfare. 3. Representation of the President, A.P. Secretariat Association. 4. Representation of the Chairman, JAC of Employees, Teachers, Workers Associations. 5. Representation of the Chairman, JAC of Employees, Teachers, Workers and Retired employees Associations (AP JAC Amaravati). In the G.O. 1st read above, the Contributory Pension Scheme was introduced with effect from 01.09.2004 to all state Government employees who are recruited on or after 01.09.2004. The employees covered under Contributory Pension Scheme are barred from the applicability of A.P. Revised Pension Rules 1980. Accordingly, employees covered under Contributory Pension Scheme are not eligible for benefit of gratuity. 2. In the reference 2nd above, the Government of India allowed the benefit of ‘Retirement gratuity and Death gratuity’ to the Government employees covered by National Pension System on the same terms and conditions, as are applicable to employees covered by Central Civil Service (Pension) Rules, 1972. 3. A large number of representations have been received from the respective Service Associations for grant the benefit of ‘Retirement gratuity and Death gratuity’ on the lines of orders issued by the Government of India to all the Government employees recruited on or after 01.09.2004 and covered by Contributory Pension Scheme. 4. After due consideration, it has now been decided that the Government employees covered by Contributory Pension Scheme (NPS) shall be eligible for benefit of ‘Retirement gratuity and Death gratuity’ on the same terms and conditions, as are applicable to employees covered by A.P. Revised Pension Rules 1980.